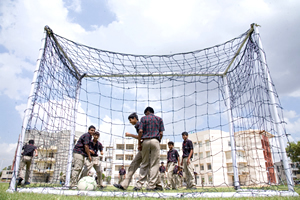 The school has host of sports facilities including Cricket, Soccer, Badminton, Skating etc. Its Soccer/Football facility is the most promising among others and is preferred by students and parents of prospective football learners. 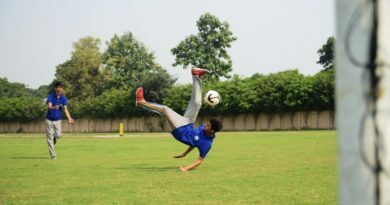 PSG football academy is one of the hottest sports training centre for Football in India. No doubt the Gurgaon branch is also most sought after options for parents. Parents have given good feedback for Tennis. However, for other sports training, the reviews might be a mixed bag. The above gives good competition to PSG academy for football training. For those parents looking for shooting training for their kids, this has been considered a reasonably satisfactory option. Skating and Swimming are sports that have got decent feedback from the parents. Recently, shooting was also introduced in the school. 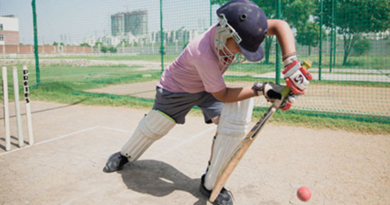 Following options are available-Swimming – Half Olympic Size Pool, Lawn tennis, Cricket, Football, Gymnastics, Horse-riding, Basketball, Skating, Taekwondo, Yoga, Pool, Table Tennis, Chess, Carom. However, Swimming and Tennis are the two best options to pursue in the school. This is an excellent options for those willing to take up table tennis as the sport of their choice. The academy has received very good feedback from parents and players alike. A perfect destination for those seeking career in Basketball. It is running other sports too but Basketball has been their forte. Most of the above mentioned schools running academies keep the academy open to outsiders during evening hours or during off-school days. If you are aware of any other coaching center, coach or academy, do share with us so that we could add it to the list.